Officials in Chile say their consul in Venezuela, Juan Carlos Fernandez, was the victim of an "express kidnapping". 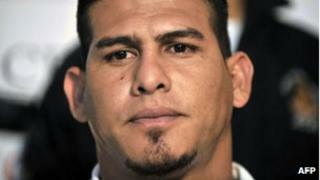 Mr Fernandez was abducted on Friday as he was leaving a hotel in the capital, Caracas. He was held for two hours, during which he was threatened, hit and shot at, before being dumped on a busy street. Abductions are not uncommon in Venezuela, where criminals hold high-profile victims until their families pay hefty ransoms. Many cases are resolved within days, if not hours - the reason why they are commonly referred to as "express kidnappings". The Chilean Foreign Ministry said Mr Fernandez had received numerous blows and threats, and had been wounded by a gunshot. He was treated in hospital and released on Sunday. Mr Fernandez's kidnapping came just days after that of US major league baseball player Wilson Ramos, who was freed by soldiers after being held captive for 48 hours. On Monday, police in Venezuela detained five Colombians suspected of involvement in the kidnap of Mr Ramos. A total of 11 people - five Colombians and six Venezuelans - are in custody over his kidnapping. According to the Venezuelan government, 686 people were kidnapped in 2009, the last year for which it released official figures. But non-governmental groups say the numbers are likely to be much higher, with many express kidnappings in particular going unreported.